As the days get longer and the weather begins to brighten up, people’s thoughts begin to turn to training for next seasons Triathlons. To stay injury free during your training here our our top tips. Having raced in Triathlon’s and Duathlon’s internationally for quite a years, remaining injury free has been of major importance to be able to train the many hours required to be successful in these multi-discipline sports. Even though I have experienced my fair share of injuries, only on rare occasions have I had to totally stop training, mainly due to the way I respond to injures. The key is listening to your body and adjusting your training at the first signs of injury, rather than hoping it will just go away – they rarely do. For example, when I started to develop achilles tendinitis as a result of running on cobble stones, I immediately backed off running and spent more time in the pool interval training using an aquajogging belt. Along with physiotherapy treatment, the strategy allowed me to keep training with the required volume and intensity and therefore no loss any fitness or performance. Downtime from running was minimised and in fact, the aquajogging aided the achilles recovery process (see article on soft tissue injuries). As a Sports Physiotherapist, once I have established a diagnosis and treatment plan, it is important for me to provide the injured athlete with a training strategy that will help to maintain their fitness as well as keep them motivated. Aquajogging is often a great option, especially when using high intensity intervals. But it is not the only option, and the advice I give the athlete will depend on the type, location and extent of the injury. Running injuries like “runners knee” are more common than injuries developed through swimming or cycling, but they do happen. The repetitive impact nature of running coupled with poor running form or incorrect running shoes are the two most common causes of running injuries. 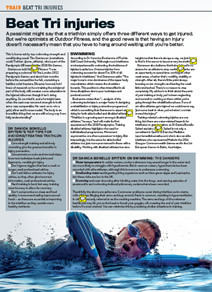 Here is a recently published article in Outdoor Fitness magazine on how to beat Triathlon injuries. Also see my article on How to avoid Running Injuries. We’ve got 3 great pdf’s from Out Door Fitness Magazine, part written by Phil Mack, on how to avoid injury while training for a Triathlon. Click on the 3 images below to open each up in your browser. Or right hand click to save them to your desktop for reading offline later.